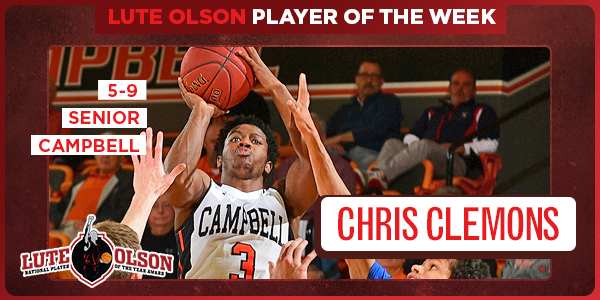 BOSTON (MA) -- Campbell's Chris Clemons earns the Lute Olson award national player of the week honors. The 5-foot-9 senior helped the Fighting Camels win the Big South regular-season championship. On Wednesday he had 32 points, five rebounds, four assists and four steals against USC Upstate. On Saturday he finished with 30 points against defending Big South champion Radford.